To watch this one I hope you�ve brought your brain, this show is not for the faint of mind. The story line is very in depth and is hard to understand, you can�t be kickin� back and not paying attention, otherwise you will have no idea what�s going on and I mean NO idea. 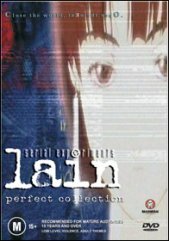 The story revolves around a young girl named Lain, she is very weird, she has no friends and the people that do have time for her are always picking on her, though do find the time to exploit her. The story is all based around one thing, The Wired, this place is kind of like the internet but much more. You can enter it and walk around just as if you were actually there. Now Lain is about thirteen years old but her interest in The Wired has only just begun, though she doesn�t know it, she�s a natural when it comes to interacting with The Wired. She has, as far as I can tell, a split personality and her other personality is wild, quite the opposite to her every day demeanor, now Lain finds her self communicating with entities unknown and though she doesn�t realize it she is duped into hacking into unauthorized areas and performing illegal acts. Many people around the world and especially at Lain�s school have been committing suicide, as the story proceeds you will find out that the suicides are not a matter of depressed teenagers or mid-life crisis�, no, they are that of humans shedding their mortal coil to evolve into a pure energy being. These pure energy beings live and exist in The Wired, this is also how they interact with each other and the outside world, and though they are seemingly harmless they try to get others to join them and become part of their world; the next human evolution. This does involve suicide though. The story evolves into a confusing swirl of character personality insights and one hell of a confusing plot. Bear in mind the show will be a bit confusing for a while but around the second DVD you will say to yourself �Ah, it�s all coming together�, but just be ready for the twists. It all comes together in the end, if you pay attention. It really isn�t for children, you have to be a big fan of manga if you understood Akira the first time you have a chance if you have watched it three times and you still can�t get the hang of this, then don�t bother its way out of your league. I dare say that you will have to have some sort of insight into movies and read the signs otherwise you�ll be lost. The drawing in the show is fantastic the animators have taken great care with every scene and you can really tell that they haven�t sacrificed anything to bring you a great story and tremendous animation. The DVD quality over all was unsurpassed not jumping no low level noise and no hissing in the quiet scenes, the clarity of the sound was perfect; the sounds reflected exactly what was going on and they weren�t obvious. Bottom line, the sound and picture quality is far and above any manga movie/series I have ever seen, though still very hard to get a handle on. Extras include Bi-lingual with subtitles, animated menus, original trailers, artwork such as stills and concept pieces and if you look hard enough you can find some hidden extras, I�ll let you find those ones.